We have introduced some tweaks to Site Explorer summary. At the start of August we quietly released an update that we’re pretty proud of. When you enter a domain or URL that is at the top of a redirect chain, we will move through the chain and report back the eventual target page title. Previously we could only show a N/A as the page title for your search term, but we’re now delighted to report back the effective page title. This may sound trivial, but there are so many large websites out that immediately 301 or 302 redirect their main URL to a subordinate page. Now that we have this, we’ve tweaked the page design to really highlight the page title. Our investment in complimentary data clusters is really starting to pay off. Last month we released Flow Metrics History lookups, and we’re delighted to extend this to all of our high-level metrics. External Backlinks, Referring Domains, Referring IPs, and Referring Subnets for root domain searches in our Fresh Index will now return relative movement for the last seven days, really helping you instantly see the current velocity of any domain in our dataset. Our Historic Index, a comprehensive index of all of the links we’ve found in the last five years, is a feature on our Pro plans and above. However, we feel that the Historic External Backlinks number is so important when evaluating a domain, or URL, that we’ve decided to give it for free. We also very proud of our index size, and want to sing about it. Our Historic Index numbers are mind-blowingly huge, and frequently ignored in, “who has the biggest Index” blog posts. When we talked to customers, we found that many of them loved Topical Trust Flow, but were looking for easier ways to include it in client reports. Site Explorer Summary now has a dedicated Topical Trust Flow breakout panel, easy to Copy and Paste into your PDF reports. 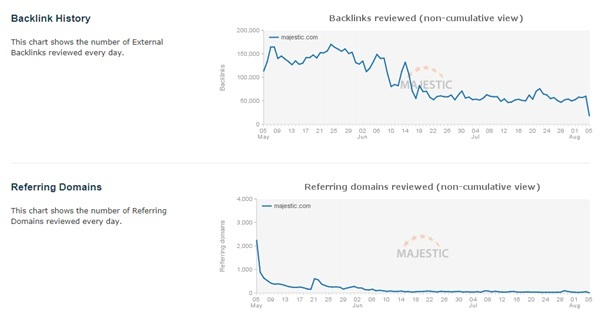 We’ve opened up our Backlink History and Referring Domains charts, letting you see more detail, instantly. We’re always looking to improve and evolve Site Explorer Summary. If there’s anything that you’d like to see in there, or prefer to have in a different format, please do let us know. Over the last few months, you may have noticed us experimenting with our free service offering. It is incredibly difficult to balance the needs between prospective customers who would love to try Majestic without obligation or registration, and those who write scrapers to take advantage of any free data that we choose to share. Supporting these challenges is becoming an increasing burden, to the extent that the overheads of managing the free service are reducing our developers’ availability to enhance our product. While we are happy to run a limited free service as a part of our freemium model (and to give something back to the wider community), trying to manage the demands of a few scrapers who want a high-volume API for free is unsustainable. We have tried engineering solutions, but it’s relatively technically simple to employ proxies to bypass fair usage limits based on IP address, and we feel that completing endless Captchas or providing Credit Card details just for a quick look at Majestic is an annoyance for genuine users, an annoyance that we’d like to avoid for as long as we can. We’ve come to the conclusion that we cannot maintain our preferred goal of a free service that gives the full Majestic experience, albeit for a limited number of search terms. Our business model also needs to evolve to reflect the new demands as the market we serve moves from early adopters to a wider audience. So, rather than retire our Free service, we have started to look upon it as an introduction to both Majestic and backlink searching. We will focus on those metrics that will mean the most to new people to our market sector, and push the metrics that matter more to professionals into our paid plans. What about Verified Domains for free users? There is no change for verified domains. You’ll still see all the numbers you’re used to seeing. If you own a domain, and can show that you own that domain, we are happy to give you full Lite Site Explorer access for that domain. That’s all major metrics, and all tabs. All you’d be missing out on is Topical Trust Flow. No credit card is needed, and our free accounts can have up to five active verified domains at any one time. If you are a site scraper, angry that we’ve changed the site again, please talk to us about our API plans. Signing-up may not give you the buzz of beating the system, but we have an always-on, reliable API that will give you peace of mind, and take away the pain of constantly maintaining and updating your scripts and bots. Very pretty! I really like this. I am Ron. I have submitted some urls in majestic before 2 days ago after doing some link building for thinksteer(.)com. but still majestic is not crawl the urls. Yesterday I have seen that my TF is 2 but today is showing 0. Can you please tell me what is happening. It looks to have found your site just fine now. There are many layers to a search engine – the Crawl, the algorithms process and the front end. Every 24 hours or so the crawl raw data gets taken and we start to process it. This takes about 24 hours to do all the maths, then the data gets propagated out to our optimized indexes so that it can be seen on the web front end. There are parts of the system that work faster than this, but the Flow Metrics are the really powerful part of Majestic, purely because they involve a calculation on all the links from a trillion page (more in the historic index). But looks like your site is now all set.